Rotary District Governor Craig Loughery of Ely attended the Park Rapids Rotary Club meeting Wednesday, Nov. 18 and presented the club with two awards. 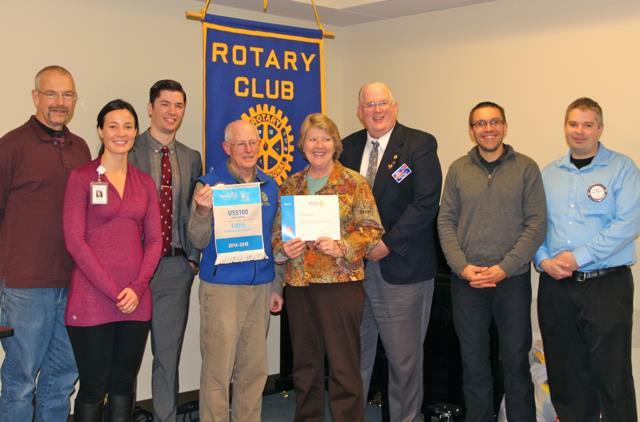 One recognized the club as the only one in District 5580 earning the Every Rotarian Every Year award for contributions to the Rotary Foundation. Loughery also presented a certificate recognizing the club for donating more than $1,500 to Polio Plus. The club also welcomed a new member and learned about international service projects in Guatemala from the guest speaker. Gathering for a photo were (from left) Past President Ed Ranson; Missy Lindow, new member mentor; Tyler Golberg, guest speaker and member of the Alexandria Rotary Club; President John Rasmussen; Joan Tweedale, Polio Plus chair; Gov. Loughery; Justin Domogalla, the club’s newest member; and Ryan Mathisrud, his sponsor.